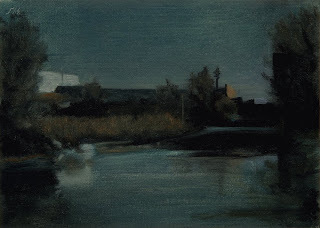 Woodward Ave House, oil on canvas panel, 7"x5"
Rouge Nocturne #2, oil on canvas panel, 7"x5"
This daily oil painting is of an evening scene along the River Rouge. 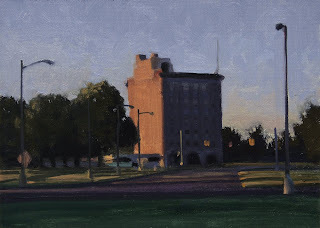 The hulking buildings are the Morton Salt silos. 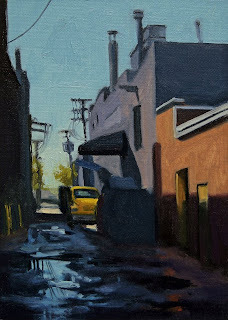 Eastern Market Alley, oil on canvas panel, 7"x5"
This daily oil painting is of an alley in Detroit's Eastern Market. 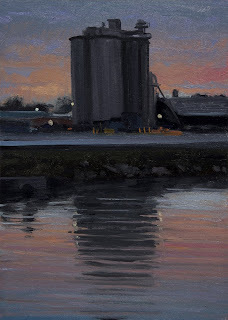 I was interested in the dark shadows and sky reflections and the contrasting colors in this scene. 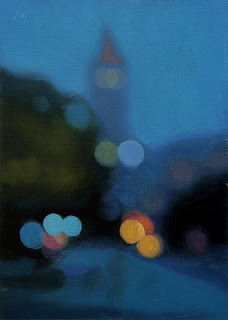 Citylights #35, Fisher Building, oil on canvas panel, 7"x5"
This daily oil painting is from the Citylight Series, this scene is of the Fisher Building as seen from Woodward Ave.
Citylights #34, oil on canvas panel, 7"x5"
This daily oil painting is from the Citylight Series, this scene is of Woodward Ave. 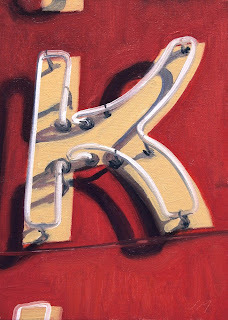 The Detroit Alphabet I, oil on canvas panel, 7"x5"
This daily oil painting, The Detroit Alphabet I, is from the neon sign on the Vinsetta Garage building on Woodward Ave. A little red, white and blue for today. G.M. 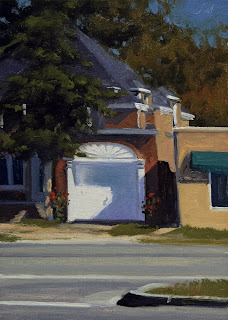 Building, oil on canvas panel, 5"x7"
Daily oil painting of the General Motors Building. We in Detroit hope the bailout plan will be approved. We don't agree about everything they have done in the past, and much of their problems were brought on by themselves. But the whole banking mess has not helped, 2.5 million jobs are in peril. Michigan has been in a recession for five years and this would really destroy the state if the big three don't surive. 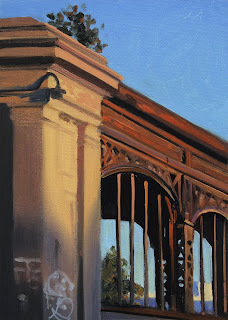 Long Shadows , oil on canvas panel, 5"x7"
Mi Central, Detail #3, oil on canvas panel, 7"x5"
This daily oil painting, Michigan Central, Detail #3, with warm evening light creating a wonderful warm glow against a clear blue sky. 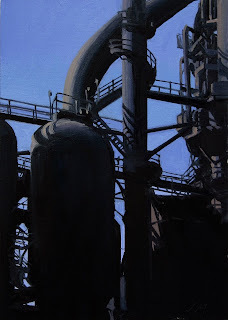 Rouge, oil on canvas panel, 7"x5"
This daily oil painting, is of a River Rouge blast furnace with a cobalt blue sky. 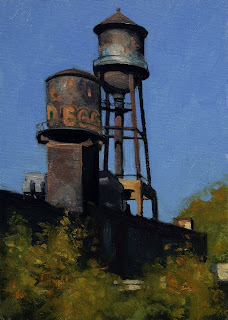 The Detroit Alphabet F, oil on canvas panel, 7"x5"
Eastside Watertank, oil on canvas panel, 7"x5"
Daily oil painting of Eastside Detroit watertanks with a red door. Click on book image to preview or purchase. 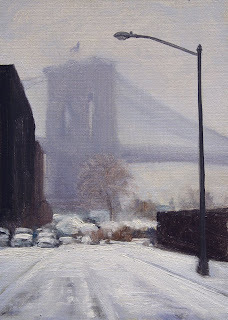 Brooklyn Bridge #12, oil on canvas panel, 7"x5"
Daily oil painting of New York's Brooklyn Bridge. 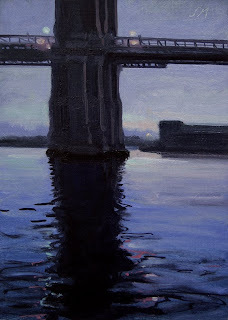 To celebrate the Brooklyn bridge's 125th. anniversary. 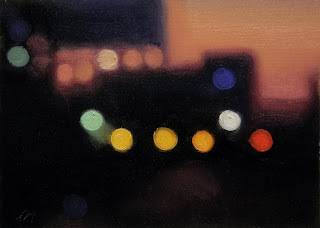 November Glow, oil on canvas panel, 7"x5"
Daily oil painting of a Detroit evening scene. 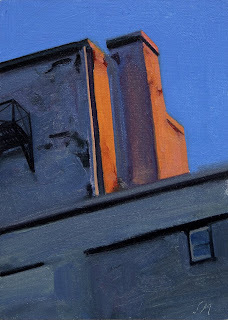 Warm November light catching a wall on a downtown building. 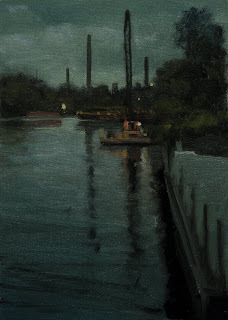 Citylights #33, oil on canvas panel, 5"x7"
Daily oil painting of a Detroit evening scene. 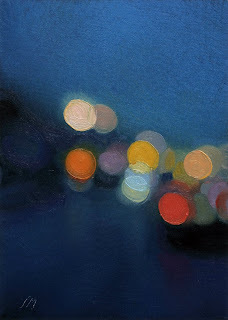 This is the thirty third in the colorful citylight series of blurred city images. 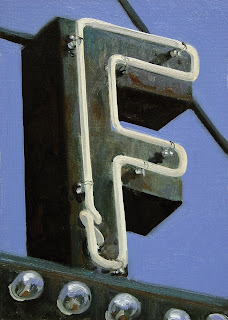 The Detroit Alphabet U, oil on canvas panel, 5"x5"
Daily oil painting of a Detroit sign. 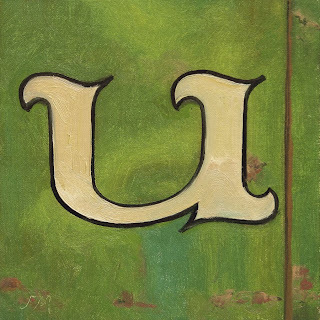 The letter U is on the side of a building on 12 mile Rd. in Berkley. 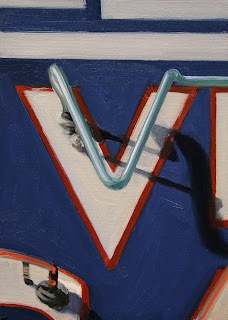 The building is under construction and the old Cunningham Drug Store sign was uncovered much to my delight. 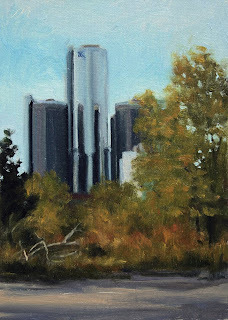 City Reflections, oil on canvas panel, 7"x5"
Daily oil painting of a Detroit street scene with reflections in a flooded street. 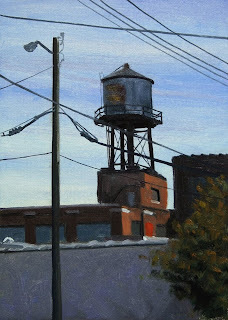 This building is near the Pioneer Building, a large industrial warehouse type building that has been converted into artists lofts. The artists of the Pioneer Building were having an annual sale and I shot these before going in. 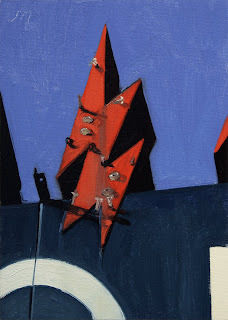 to look at the artwork. 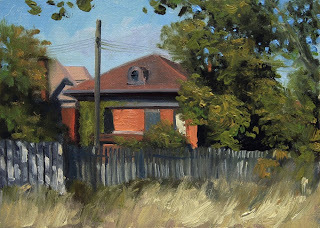 Sunlit Fence, oil on canvas panel, 5"x7"
Daily oil painting of a house and sunlit fence in Brush Park. 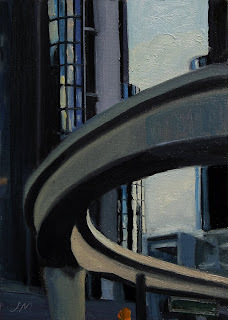 I like doing urban landscapes with some kind of pole to break the picture plane. 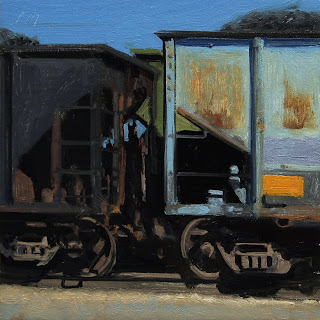 It may remind me of Edward Hopper as he used this device often in his urban paintings. 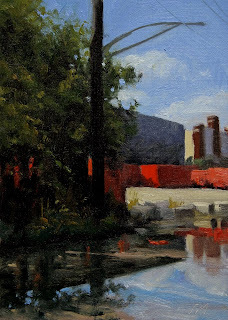 I really liked the wild foreground area and the fence in this painting. 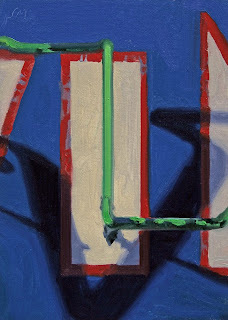 The Detroit Alphabet K, oil on canvas panel, 7"x5"
The Detroit Alphabet V, oil on canvas panel, 7"x5"
Brooklyn Bridge #11 oil on canvas panel, 7"x5"
City Nocturne, oil on canvas panel, 7"x5"
City Nocturne, oil on canvas panel, 5"x7"
Limeplant, Detail, oil on canvas panel, 7"x5"
This is a detail of the limeplant in Northern Ohio where my grandfather worked in the 40's & 50's. It has changed very little. I remember seeing him there and he would buy me a candy bar from a machine covered in lime. He would have to wipe the lime off the glass to be able to see what was inside. Everything was covered in white lime like snow. I can still taste the acidity that was in the air. 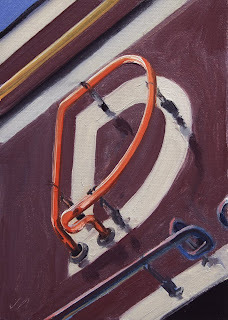 Electrified Nation, oil on canvas panel, 7"x5"
From Jefferson Ave, oil on canvas panel, 7"x5"
Rouge Coal, oil on canvas panel, 5"x5"
The Detroit Alphabet D, oil on canvas panel, 7"x5"
This D was done to honor the studio visit with the great SF photorealist painter Don Jacot, who was in Detroit for a few days. It was a great pleasure to finally meet him and talk shop. 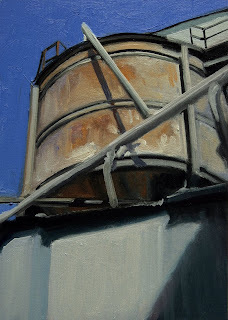 Warehouse Tanks, oil on canvas panel, 7"x5"